We explore the possibility that the fundamental theory of nature does not contain any scale. This implies a renormalizable quantum gravity theory where the graviton kinetic term has 4 derivatives, and can be reinterpreted as gravity minus an anti-graviton. We compute the super-Planckian RGE of adimensional gravity coupled to a generic matter sector. The Planck scale and a flat space can arise dynamically at quantum level provided that a quartic scalar coupling and its β function vanish at the Planck scale. This is how the Higgs boson behaves for M h ≈ 125 GeV and M t ≈ 171 GeV. Within agravity, inflation is a generic phenomenon: the slow-roll parameters are given by the β-functions of the theory, and are small if couplings are perturbative. The predictions n s ≈ 0.967 and r ≈ 0.13 arise if the inflaton is identified with the Higgs of gravity. Furthermore, quadratically divergent corrections to the Higgs mass vanish: a small weak scale is natural and can be generated by agravity quantum corrections. R. Barbieri and A. Strumia, The ’LEP paradox’, hep-ph/0007265 [INSPIRE]. A. Linde, Inflationary Cosmology after Planck 2013, arXiv:1402.0526 [INSPIRE]. C.P. Burgess, S.P. Patil and M. Trott, On the Predictiveness of Single-Field Inflationary Models, arXiv:1402.1476 [INSPIRE]. G.F. Giudice and H.M. Lee, Starobinsky-like inflation from induced gravity, arXiv:1402.2129 [INSPIRE]. T. Prokopec and J. Weenink, Naturalness in Higgs inflation in a frame independent formalism, arXiv:1403.3219 [INSPIRE]. J. Joergensen, F. Sannino and O. Svendsen, BICEP2 hints towards Quantum Corrections for Non-Minimally Coupled Inflationary Theories, arXiv:1403.3289 [INSPIRE]. Planck collaboration, P.A.R. Ade et al., Planck 2013 results. XXII. Constraints on inflation, arXiv:1303.5082 [INSPIRE]. C.T. Hill, Conjecture on the physical implications of the scale anomaly, hep-th/0510177 [INSPIRE]. S. Iso and Y. Orikasa, TeV Scale B-L model with a flat Higgs potential at the Planck scale - in view of the hierarchy problem -, PTEP 2013 (2013) 023B08 [arXiv:1210.2848] [INSPIRE]. I. Quiros, Scale invariance and broken electroweak symmetry may coexist together, arXiv:1312.1018 [INSPIRE]. I. Quiros, Scale invariant theory of gravity and the standard model of particles, arXiv:1401.2643 [INSPIRE]. J.C. Alonso, J.F. Barbero G., J. Julve and A. Tiemblo, Particle contents of higher derivative gravity, Class. Quant. Grav. 11 (1994) 865 [INSPIRE]. J. Maldacena, Einstein Gravity from Conformal Gravity, arXiv:1105.5632 [INSPIRE]. I.G. 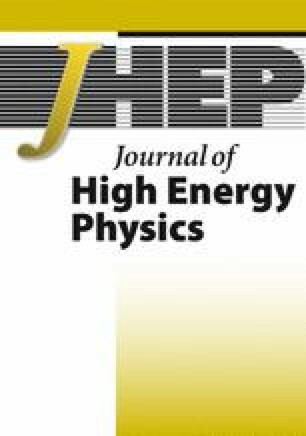 Avramidi, Covariant methods for the calculation of the effective action in quantum field theory and investigation of higher derivative quantum gravity, hep-th/9510140 [INSPIRE].